When I was a child, we had a Shabbat meal every Friday evening. I loved the rituals. My father recited the Kiddush over a cup of sweet as syrup wine that my parents allowed me to sip. We said hamotzi, the blessing over bread, on a basket of hot flaky rolls, the kind from the refrigerator section of the grocery. (You know, the ones that pop out of the can when you hit it on the counter.) My sister and I "helped" our mother in the kitchen, dotting the rolls with margarine before they went into the oven and licking the beaters and bowl from the cake she made each week in a heart shaped pan. My mother lit the Shabbat candles throughout the year at 6 P.M. so that we could finish dinner in time to drive to the synagogue for 8:00 P.M. services. On those reliable routine family nights my sister and I basked in the extra attention our father, who worked long hours all week, gave us. I thought a quiet, family, no-TV night would be good for all of us. Would my husband go for it? He was raised in a totally secular, but Jewish, home and had no such memories to draw from. David worked hard, traveled often and stressed about his business. De-stressing usually meant relaxing on the sofa, remote control in hand. But my daughters and I wanted what was then called "quality time." I thought a quiet, family, no-TV night was a great idea. He did not quite agree. The dining room, even lit with Shabbat candles, could not hold a flame to the remote control. 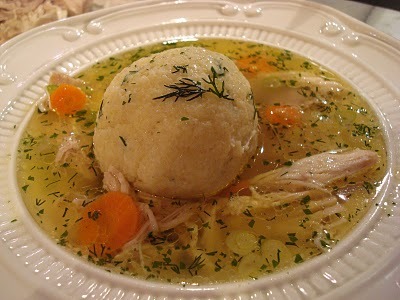 As I watched my husband enjoy his soup, slipping his spoon into almost perfect matzoh balls (it was, after all, my first attempt), the tension in the room melted away. We giggled at our daughters' antics; they were enjoying this change of scene and routine. The meal came out of the kitchen, we ate our fill and soon the girls disappeared to play. David and I were left alone to talk about the week and visit together quietly without distraction. Then he said these words, which would forever change our lives, "If you make this chicken soup every week, we can make Friday night Shabbat every week." But he did not. In fact, he learned to say the Kiddush. And we decided to talk about the Torah portion of the week. We read The Children's Midrash a book of Torah stories for children, which taught us as well as our girls more about Judaism. Soon we were reading books on keeping kosher and the laws of Shabbat. Often we invited friends to join us for those dinners. They always shared something to enhance our appreciation and understanding. Along the way, in those months of chicken soup Shabbats, our approach shifted. Our move into making Friday night Shabbat began as a nice way to end the work filled week; a break from the day to day; a time to disconnect and relax. A day to recharge our batteries in order to enter the next week refreshed. A day off. We began to look forward to Shabbat, not because it was down time, but because it was a time to be truly on. I recently heard it said that more than Shabbat is a day off -- it is a day on. And over time, this became true for us. Friday nights, David and I tuned in on each other. These nights and the rituals had a positive effect on our daughters. Every week the Torah had something to teach us that was right on, relevant to our lives. Shabbat gave us something elevating to hold on to and take with us into the new week.